Boasting a towering performance by Trine Dyrholm in the title role, NICO 1988 is a look at the last three years in the life of the performer known as Nico. Her real name was Christa Päffgen and she hated talking about her days in the Velvet Underground. We watch as she tours stoned out of her mind and then cleans herself up and gets her life together. Dyrholm is amazing. That the film is magnificent as it is due entirely to her hypnotic performance. Destined to be legendary, and with luck Oscar nominated, Dyrholm is force of nature. She isn’t acting but inhabiting the role. While I’ve seen clips of Nico in real life I've lost the ability to even think of the real Nico, Dyrholm is now my Nico. I can’t say anything more than that. This is a performance for the ages. More fantasia than straight on biography, much is left out and the film only really concentrates three moments in time, a long section of her 1986 European tour that she did stoned out of her mind, a 1987 tour where she and her son were trying to get clear and brief period before her death when Nico was happy. We are traveling with her in three moments of time little else. And for some that is going to be a big problem. As much as I, and people of my age loved the film, some of the younger writers I spoke with didn’t care for it. While they admired the filmmaking and the performance the fact that they knew nothing about Nico worked against their enjoying the film. They didn’t know why they should care. I can understand that, since I am not a well versed in Nico and the Velvet Underground and while I didn’t know the details I could appreciate her iconic status, something the younger writers couldn't. 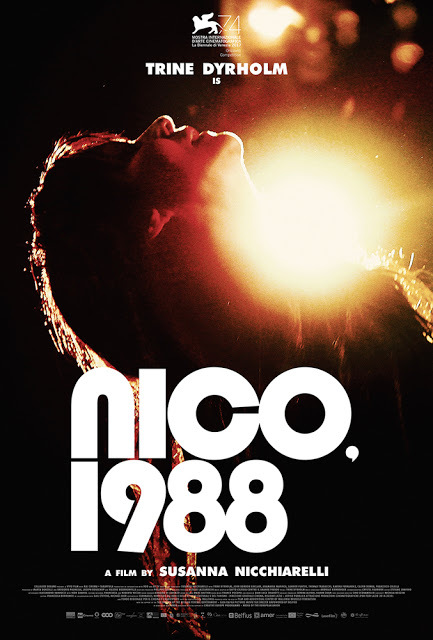 On the other hand if you know Nico or know of her or are a rock film fan this film is going to work for you to some degree. While you may not love it like me, you will probably like. Then again the film has Dyrholm central performance which makes it recommended for everyone.